Notes: Tutbury Castle is a largely ruined medieval castle at Tutbury, Staffordshire, England, in the ownership of the Duchy of Lancaster. It is a Scheduled Ancient Monument. 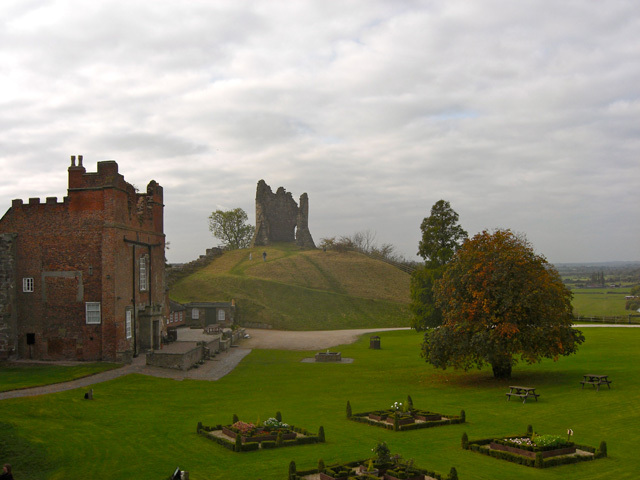 People who have stayed in the castle include Eleanor of Aquitaine and Mary, Queen of Scots, who was a prisoner here.Tutbury Castle became the headquarters of Henry de Ferrers and was the centre of the wapentake of Appletree, which included Duffield Frith. With his wife Bertha, he endowed Tutbury Priory with two manors in about 1080. It would seem that Tutbury at that time was a dependency of the Norman abbey of St Pierre-sur-Dives. The castle was destroyed by Prince Edward in 1264 after the rebellion of Robert de Ferrers, 6th Earl of Derby. In 1269, after a further rebellion the lands were given to Edmund Crouchback and have remained part of the Duchy of Lancaster. Apart from the 12th century chapel the ruins date from the 14th and 15th centuries when the castle was rebuilt. In 1999 Lesley Smith became the Curator of the Castle, which she leases from the Duchy of Lancaster.Reported sightings of ghosts include that of a soldier on the ramparts, a white lady in a window of the tower, and Mary, Queen of Scots. A number of visitors to the King's Bedroom reported feeling overcome and faint; the room was closed to the public for a while after these reports, but has since been re-opened. The castle now hosts nocturnal both private and public ghost hunts.